Book Review: Mary Karr's "Tropic of Squalor"
Mary Karr's strength is filtering the world through her compassionate heart and her transcendent faith. 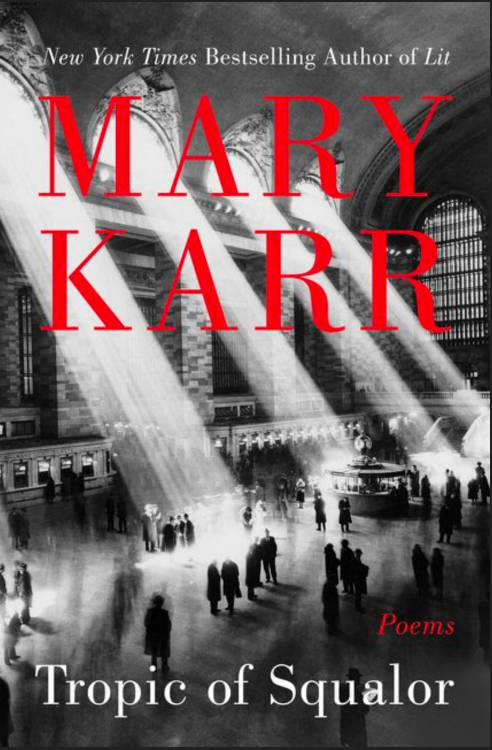 Many people know Mary Karr as a master of memoir, since she has written three - The Liar’s Club, Lit, and Cherry, all of which detailed her childhood in Texas, encounters with alcoholism (both her mom’s and her own), and her eventual conversion to Catholicism. She also wrote the bestselling book The Art of Memoir and has taught the craft to writers such as Cheryl Strayed (the author of Wild) at Syracuse University. But Karr began her writing career winning poetry contests. Her newest collection of poems, Tropic of Squalor (Harper Collins, 2018), proves that her lyrical use of language in her memoirs is so well crafted precisely because she is a poet. Her strength in both genres is filtering the world through her compassionate heart and her transcendent faith. We may wonder if her heart led her to her faith, or if her faith transformed her heart, but either way, together they make staggeringly beautiful poetry. Compassion is the theme of the first poem of the book, when a dying squirrel gets honored in his struggle. It laces her observations of a troubled teen and her mother In The Burning Girl, in which Karr writes: “Having seen that mother’s love/I testify: It was ocean endless. One drop could’ve/Brought to life the deadest Christ, and she/Emptied herself into that blazing child with all her might”. And it surprises you in Dear Oklahoma Teen Smashed on Reservation Road, as she meditates on the life that was ended in order to give her friend the gift of life through a heart transplant. Characters from her life make their appearance in several poems. Readers of her memoirs will remember the wistful tenderness she holds in poems about her father, her exasperation and sorrow over ex-boyfriend David Foster Wallace, whose suicide is recounted in the poem Read These.